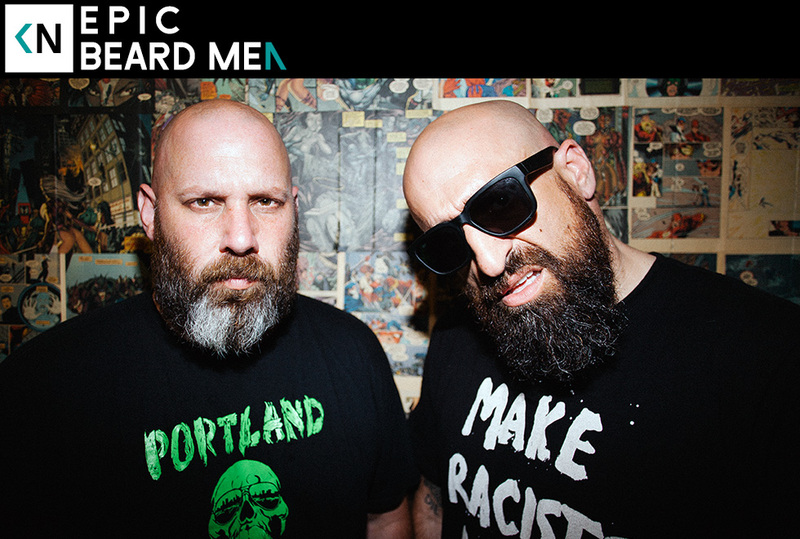 Epic Beard Men is the collaborative effort of Sage Francis and B. Dolan. The two have been touring and working together for a decade now and finally decided to team up for a full length effort. Their release Season 1 was an exercise for the established solo acts. Songwriting and conceptualizing music as a team was a new experience for both of them. Their immense performance chops, and vast knowledge of rap styles and history shine through on the project. Full disclosure: Sage Francis was one of my favorite rappers when I was about 20 years old. He was the second artist I ever opened a show for (the first one was MC Paul Barman). Dudes like him, Slug of Atmosphere, Aesop Rock, and Grouch of Living Legends made me feel a little less weird for growing up as a white kid loving rap music and wanting to participate. Mark and I used to post on Sage’s Strange Famous message board. Sage was a known curmudgeon online, blocking people that reached out in even the most polite way. My friends and I were terrified and intimidated to meet him back then. Needless to say I’ve wanted to try my hand at interviewing him for quite sometime. I found out about B. Dolan through my Sage fanboying. Dolan has always been an excellent rapper and technician. His deft ability with words led him to the spoken word poetry scene that was thriving in the early 2000’s. The fact he and Sage were both from Rhode Island and rapper / poets led to fast friendship. I’ve always respect Dolan’s outspoken political activism. His “Make Racists Afraid Again” hats were one of the first MAGA protest items I recall seeing. It was a pleasure meeting him for the first time. Felt an instant comfort and kindred bond with him, prolly because we look like long lost cousins. Tune in to hear us talk about their stories. While both completely unique, they have many surprisingly similar themes.